SAL Electronics SE-220J J-Pole antenna for the 219 to 225 Mc. band. SAL Electronics SE-DBj dual band J-pole antenna for 146/440 Mc. 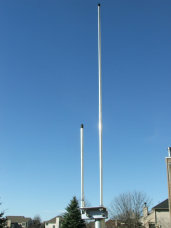 The SE-DBj, dual band J-Pole antenna covers 144 to 148 Mc., with a VSWR of 1.5:1 or less (4 Mc. bandwidth); and 420 to 450 Mc. with a VSWR of 2.2:1 or less (30 Mc. bandwidth) using a single feedline. This is ideal for most dual and radios that us a single antenna port for both VHF and UHF. Designed primarily as a 2 meter/ 70 cm dual band antenna, the SE-DBj also makes for a great scanner antenna for 28 Mc. to 900 Mc. reception. Overall height is 60"; made of 3/8" hard drawn aluminum tubing, the SE-DBj weighs just 1.5 lbs and has a 0.27 sq ft surface area. Click picture for ordering and additional information. The SE-220J, 222 Mc. 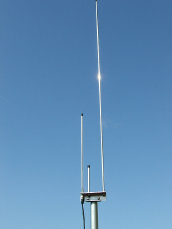 J-Pole antenna covers 219 to 225 Mc. at 1.6:1 VSWR or less (6 Mc. bandwidth). Built with 3/8" 6063-T832 hard drawn aluminum tubing, 6061-T6 angle stock, and stainless steel hardware. The SE-220J comes with a UHF female (SO-239) connector. Ideal for 222 Mc. repeater applications using vertical polarization. The antenna weighs at just 1.0 lbs, has an overall height of 39.5", and a wind load surface area of 0.17 sq ft. Click on picture for ordering and additional information. 1) 3/8" 6063-T832 hard drawn aluminum tubing construction. 2) 6061-T6 aluminum angle stock for the base plate. 3) UHF female (SO-239) RF connector. 4) Design allows antenna to operate at full legal power (1.5KW PEP). 5) mount that allows for 1" to 2" OD mast.